The mess I had to clean up this afternoon was definitely an unforeseen consequence of getting a refrigerator. Also, my readership has quadrupled since I was mentioned on Left-Handed Toons! Thanks again to Justin and Drew! 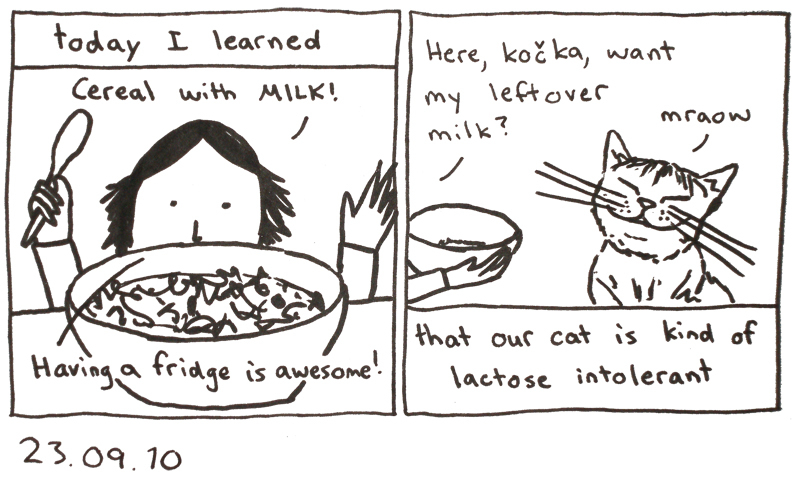 I do believe milk is bad for all cats. I suppose it is. But I used to give it to my cats growing up and they never seemed to have any problems. Lesson learned! Not all cats, but almost all, I think. Goat's milk, I think, is edible to them. Lower level of lactose or somesuch.